How can companies transform to fit the new business landscape? How can companies even realize they need to change? 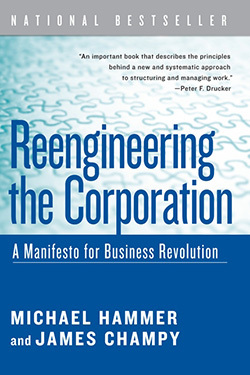 We continue our Leadership Hall of Fame series, a year-long look at the top business books and authors, with an excerpt from Reengineering the Corporation (1992) by Michael Hammer and James Champy. and buy another, change their markets, get into a different business. applies equally well to running a business. managers from the real task at hand. means no fundamental improvements in performance. work done. It is as simple and as formidable as that. From the book Reengineering the Corporation by Michael Hammer and James Champy. Copyright © 2001, 2003 by Michael Hammer and James Champy. Reprinted courtesy of HarperBusiness, an imprint of HarperCollins Publishers. Read more about Reengineering the Corporation or our Leadership Hall of Fame.